It's hard to deny that 9/11 has affected cinema, and action movies in particular, in ways that are still being felt. Terrorists changed from goofy, ready-made film villains to an all-too real and often inscrutable force of evil and watching large vehicles crashing into things, blowing things up and inflicting violence on the innocent seem quite as fun after experiencing the real-world equivalent. After an initial burst of patriotism, nationalism turned to cynicism following the Iraq War. We had fought evil and in the eyes of many, had done questionable things to do so. This ethical conflict is reflected in the moral ambiguity that has seeped into our action films, including the Bourne series, the James Bond films, even the Avengers. Now as a new breed of flawed heroes fight cinematic evil, there are costs to paid, hard decisions to make and as often as not elements of our own government are part of the problem. 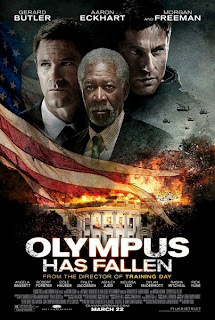 Olympus Has Fallen will have none of that and seems determined to stubbornly ignore this trend by grasping onto tropes of action films from the 1990s. A tale of Korean terrorists storming the White House and taking the President hostage, this script feels as though it might and probably should have been produced twenty years ago. Coming in the twenty-first century it might be given a pass as being naïvely quaint but for hints of something startlingly ugly beneath its would-be crowd-pleasing surface . Following along with those aforementioned tropes, our hero is Mike Banning (Gerard Butler), a secret service agent who, like all action heroes from that era, is "haunted" by a professional trauma. In this case it stems from when he allowed the First Lady to die while saving President Benjamin Asher (Aaron Eckhardt), who has never quite forgiven him for that choice. I put the word haunted in quotation marks because other than a few flashes of the incident, Banning seems more troubled by the fact it cost him his position on the President's personal detail than by any real psychological damage that he will have to rise above. But Banning will get his chance to serve Asher again when a visit by a South Korean diplomatic delegation turns out to be a highly complicated ruse to allow a team of North Korean extremists into the White House. Holding the President in his emergency bunker, they demand U.S. forces retreat from the Korean demilitarized zone and attempt to gain control of a secret U.S. weapon system. Meanwhile, Banning fights his way into the war-torn executive mansion and tries to single-handedly rescue Asher. Our hero starts off as improbably and somewhat unprofessionally chummy with the First Family. We're asked to believe that he regularly spars with the POTUS, offers accessorizing advice to the first lady and serves as friendly babysitter to the First Son, none of which rings true as to how a dedicated Secret Service agent would behave but of course ensures that once the crisis begins, it's personal. Unfortunately that's also around the point that Banning becomes less and less interesting as, true to the film's retro form, he is proven to be a hero in the Steven Seagal mold: he is always smarter than everyone else, he is always in the right and he is totally invulnerable. He's the type of guy who can shake off a two-story fall with no permanent injuries, can dodge a wave of bullets and return fire though a solid wall without looking and still hit his target and even find the time between gunfights to have a supportive phone conversation with his girlfriend. As the film went on, I found myself amazed there wasn't some abrasive bureaucratic authority who opposes the hero, a trope familiar to anyone who's seen Die Hard. Of course before long, a military official suddenly and angrily demands Banning be removed from the situation for absolutely no good reason. Perhaps Banning's ridiculous perfection indicates he's supposed to symbolize America itself. The script is eager to bolster the belief that the U.S. is the greatest nation in the world, an admirable aim that unfortunately degrades into another old trope: the unabashed jingoism of 1980s action films. A briefing sequence in which Asher meets with Speaker of the House Trumbull (Morgan Freeman) and Defense Secretary McMillan (Melissa Leo) seems to set the value scale. While Trumbull urges flexing military might, both McMillan and Asher favor avoiding open conflict and focusing on diplomacy. Of course, they end captured by members of the delegation they invited in while Trumbull is left as the man-in-charge dealing with the resulting political ramifications. There are also hints of outright xenophobia. As our hero tortures two of the terrorists whom he's captured, one begins screaming in Korean. Banning responds by hitting him again and glowers "In English..." in what disturbingly seems framed as a punchline. That jingoism also makes a bad mix with the film's implausibility, which rises as high as the Def-Con level. After all, if we have the most well-trained and dedicated armed forces and government agents, how is it that the villains, who seem a bit too well-organized and well-armed based on what we've seen of North Korea's military might, can so easily run roughshod over them? We're asked to believe that an unidentified military aircraft would be allowed to get anywhere near the nation's capitol before jet fighters try to shoot down the intruding vehicle, a lapse in judgment that, if you'll pardon the phrasing, doesn't fly in this day and age. It doesn't help that the scene it leads to, with the plane gruesomely opening fire on civilians and agents alike, is both unpleasant given the context we now have for such attacks and gratuitous since it adds little to the plot other than a chance for more violence and to give the Washington Monument its worst day since Ray Harryhausen drove a flying saucer into it. It's all a bit troubling considering director Antoine Fuqua has some real talent. Initially appearing to be another shallow visual stylist with the flashy but rather empty Chow Yun-Fat vehicle The Replacement Killers, he's managed to put together a solid resume of action films and crime dramas with Training Day, Tears of the Sun, King Arthur, and Brooklyn's Finest. In his defense, the action scenes do have impact and are on the whole coherent and it's a decent-looking picture, even if the patriotic flag imagery gets very heavy-handed and there's a distractingly hilarious overuse of onscreen titles to introduce each character and keeps us apprised of the time every few minutes in case we forget. On the acting side, Butler has proven to be a likeable enough protagonist in the past, but here he's reduced to a stolid Marty Stu action figure. Eckhardt is stuck in a part that seems crafted to make Banning look that much better since Asher is depicted as mostly helpless and prone to bad decisions, such as ordering his officials to give the villains their codes to a truly ridiculous MacGuffin of a weapons system based on the belief that he'll never give up his own code. Rick Yune proves an intimidating physical presence as the head terrorist Kang but his part is never developed beyond a cartoony terrorist archetype. Leo shows her characteristic grit in a scene where she stands up to the intruders but before long she's reduced to a whimpering (and partially undressed) wreck and Freeman seems to be phoning it in. Since he's already played the President in the past, this is probably a bit of a step down for him anyway. The supporting cast is filled with a good mix of familiar faces, most of whom seem wasted. The great Angela Bassett plays the head of the Secret Service, but her role consists solely of telling everyone how great Banning is. Cole Hauser and Dylan McDermott, both of whom somehow never quite made it to leading man status, appear in small roles as secret service agents, Ashley Judd has a bit part as the First Lady and Radha Mitchell pops up as Banning's highly patient girlfriend. Alas, she and Hauser never share any screen time; a miniature Pitch Black reunion would have been a welcome distraction. The utter silliness of Olympus Has Fallen might have proven to be acceptably mindless fun if the film didn't seem so pious in its message of how disaster can reveal a nation's greatness. This self-importance, in combination with the film's dodgy politics and refusal to acknowledge the march of time, reduce it to a curiosity for those nostalgic for an earlier iteration of shoot 'em up that the genre is probably better for having evolved beyond. As bad as the CGI is in some parts, the movie does deliver in action, and that’s all I wanted to see and enjoy. Good review Tim.